While some people have been hooked by the tale, there are those who think there's something fishy (pun intended) about the story. Singapore-based site Stomp recently reported that a Malaysian woman named Pauline Pau found herself in hot water after their Indonesian domestic helper ended up cooking a family member's pet fish. 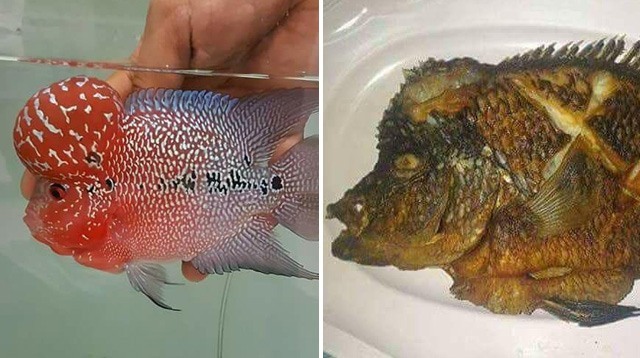 In her December 26 Facebook post, Pau related that she was aghast when she came home to see that the newly-hired domestic helper had ended up cooking her brother's prized "Luo Han" or flowerhorn cichlid fish. Apparently, before she left the house, Pau had reportedly instructed the domestic helper to cook all the seafood that they had in stock. Pau wrote, "I'm not sure if I should blame my domestic helper because my instructions may have confused her. Should I be more upset with myself or her?" But while some people have been hooked by Pau's tale, there are those who think there's something fishy (pun intended) about Pau's story. Several people have commented that the fishes featured in the photos Pau shared are two different creatures.